Pictured are Adam Hanley, Carley Codner, Timothy Powell, and James Shutters. 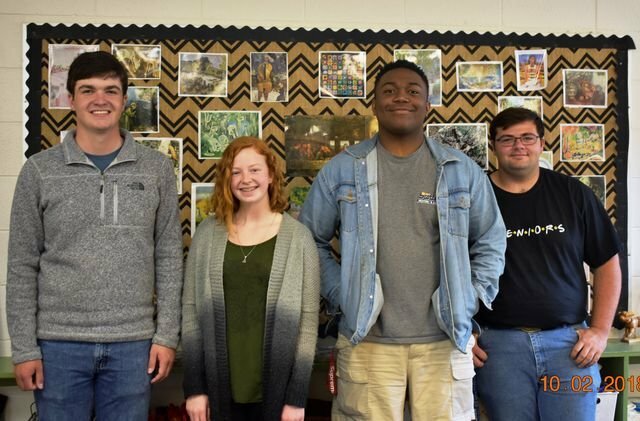 The Kiwanis Club of Sumter County held an art contest recently for middle school and high school, and Southland had several winners in the competition. The overall show winner was Timothy Powell, who won with an acrylic painting, “Cosmic Tears.” He will be moving on to district competition now. Southland also had three individual winners. First place for 12th grade went to Adam Hanley for his pencil drawing, “Mr. Red Bird.” Adam will also be moving on to district competition. Second place for 12th grade went to James Shutters, who won with a three-dimensional snake made from old bottle caps, entitled “Snake.” Second place for 9th grade went to Carley Codner, who won with a three-dimensional scene entitled “Oasis.” Congratulations to these students!